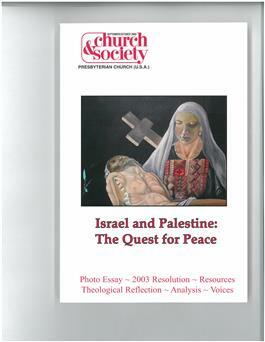 In response to the continuing political crisis, the 2003 GA resolution, ""Israel and Palestine: End the Occupation Now,"" two recent conferences and the call for ""comprehensive study resources"" on the Middle East, this issue of Church & Society Magazine provides theological reflection, analysis, resources for further study and engagement, and voices of the people and churches of the region. Photos by David P. Young and paintings by several Middle Eastern artists are featured. Actual shipping charges apply to this order at the time the order is processed. Visit www.pcusa.org/acswp/church-and-society.htm to download magazine covers and tables of content.